P clips are used extensively in many industries for securing pipes, hoses and cables. The snug fitting EPDM liner enables the clips to clamp the pipes, hoses and cables firmly without any possibilty of chafing or damage to the surface of the component being clamped, and of course they can be supplied without liner. The liner also absorbs vibration and prevents water penetration into the clamping area, with the added advantage of accomodating size variations due to temperature changes. EPDM is chosen for its resistance to oils, greases and wide temperature tolerances. 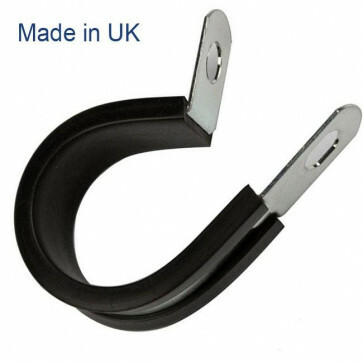 The P Clip band has a special strengthening rib which keeps the clip flush to the bolted surface. The fixings holes are pierced to accept a standard M6 bolt, with the lower hole being enlonged to allow for any adjustment that may be necessary when lining up the fixing holes.